According to some recent statistics, the average family has less than 3 days worth of food on hand. Are you in this category? Are you one of those nonprepared families that has less than 3 days worth of food on hand? If so, what are you doing to remedy that? Are you putting together a plan to store some food “just in case,” or are you planning a last-minute run to the grocery store — along with everyone else — to try to buy bread, milk, and eggs when disaster strikes? If that’s your “plan,” good luck. Listen, by the time you get to the store, there likely won’t be anything left to buy. When a disaster strikes, people descend like locusts on the grocery stores, and things like, bread, milk, eggs, and batteries are the first things to be snatched up. The grocery stores, due to just-in-time inventory practices, don’t keep a stockroom full of merchandise to go out onto the floor. Companies like Wal-Mart, for example, put out their stock as soon as it comes in; what they have in stock is already on the shelves. So the average grocery store only has about two days worth of stock on hand during normal consumption patterns. 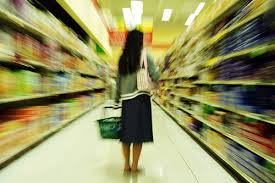 When everyone goes running to the store in preparation for a disaster, they likely buy more than they normally would otherwise, so the shelves are stripped bare faster than usual. Wouldn’t you rather be safe at home, knowing that you have a few days worth of food on hand, rather than fighting for the necessities in the supermarket aisle along with everyone else? I know I would. That’s why I store food: I like the peace of mind, knowing that I’ll always have enough to feed my family. If you don’t have any food stored, I urge you to begin. Just start with a week’s worth. Trust me, you’ll feel better knowing that you have some extra food storage set aside. Up your disaster preparedness quotient! We understand that not everyone has it in there budget to go out and buy a two month supply of food for each family member. But start stocking up now. When you go grocery shopping and you see a canned item that is on sale, buy a couple more than you normally would and put that in a storage room. Buying in bulk is cheaper than buying small items. We also recommend buying Heirloom seeds and have on hand supplies needed for gardening so you can have a replenish-able food source. We also suggest having Dehydrated Food as part of your stored food.